This article is about the settlement in New Zealand. For the major settlement in Yorkshire, UK, see Wakefield. The small New Zealand community of Wakefield is situated some 25 km south west of Nelson at the top of the South Island. First settled in about 1843, it was originally called Pitfure. However the name was soon changed to Wakefield, and it is believed to have been named after the birthplace of one of its original settlers, who was from Wakefield in Yorkshire. It is often assumed that the settlement was named after Captain Arthur Wakefield, who led the expedition that first established Nelson City and Province. Arthur Wakefield was killed in the Wairau Affray and it is assumed that the event has helped confirm the change of name from Pitfure to Wakefield. Wakefield is notable for Wakefield Primary School, the oldest school in continuous usage in New Zealand. It was set up in 1843 by Mary Ann Baigent, the wife of Edward Baigent. St John's Church in 120 Edward Street, built in 1846, is New Zealand's second oldest surviving church. It is registered by Heritage New Zealand as a Category I heritage structure, with registration number 40. Wakefield comes under the responsibility of the Tasman District Council, which has its offices in the nearby town of Richmond. It is part of the West Coast-Tasman general electorate. ^ Reed, A. W. (2010). Peter Dowling, ed. Place Names of New Zealand. Rosedale, North Shore: Raupo. pp. 449f. ISBN 9780143204107. ^ "Our School". Wakefield School. Retrieved 7 July 2011. ^ "St John's Church (Anglican)". Register of Historic Places. Heritage New Zealand. Retrieved 11 May 2012. 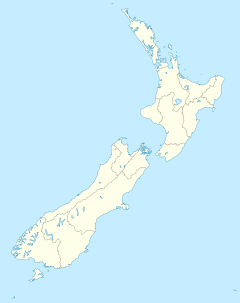 Wikimedia Commons has media related to Wakefield, New Zealand. McAloon, J. (1997). Nelson, A Regional History, Cape Catley.